Egypt's State Council issued a ruling late on Wednesday, calling upon the Ministry of Interior to issue a certificate... to show that (Abu Ismail's) mother has never held another nationality other than her Egyptian nationality. 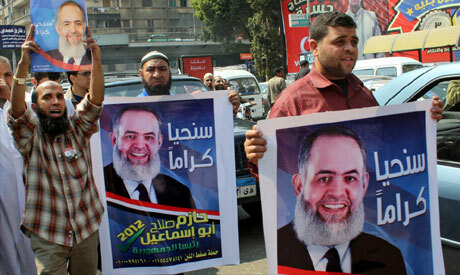 The ruling prompted around 2,000 of Abu-Ismail's supporters, who gathered in front of the State Council's offices in solidarity with the presidential hopeful, to ecstatically celebrate. They chanted "Where's the press? Here is the president" and "The people want Hazem Abu-Ismail," before performing mass Islamic prayers to express gratitude for the ruling -- causing a traffic jam in the process. The Salafist presidential contender had filed a lawsuit on 4 April with the State Council against the head of the Supreme Presidential Electoral Commission (SPEC) Abdel-Moez Ibrahim and Interior Minister Mohamed Ibrahim, demanding the government issue an official certificate confirming his mother does not hold dual nationality as media reports have recently indicated. Egyptian electoral laws prohibit anyone who holds a foreign nationality, or whose parents do, from running for the country's highest office. The verdict, however, does not conclusively confirm that Abu-Ismail's mother did not hold US citizenship. The SPEC is not subject to judicial authority pursuant to Article 28 of the constitutional declaration issued by the ruling military junta following a popular referendum in March 2011. The SPEC is therefore not legally obliged to obey any court ruling and is solely responsible for its decisions, including the elimination of presidential candidates it deems illegible. Egypt's interior and foreign ministries and the US State Department have stated that Abu-Ismail's mother acquired a US passport before she died. Abu-Ismail, however, denies allegations his mother held US citizenship and has demanded official documentation proving such claims. The SPEC is expected to announce a list of applicants, who are legally qualified for the presidency on 26 April. Abu-Ismail is the son of late high-profile Islamist figure Salah Abu-Ismail, who was a prominent Al-Azhar scholar, a long-standing member of Parliament and a member of the Muslim Brotherhood. The Salafist contender announced his bid for the presidency in May 2011 and has been considered a frontrunner in the 2012 race. His bid, however, has faltered since reports circulated that his mother was a US national. Presidential elections will take place on 23 and 24 May, and the president will be named on 21 June after a runoff-voting round on 16 and 17 June.